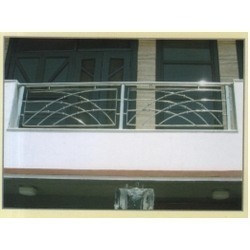 With the help of our vast infrastructure facility and a highly talented workforce, we have been manufacturing and supplying Mild Steel and Stainless products such as Gates, Window, Main gate and Balcony Grills, Designer, Elegant and Stylish Staircase Railings in Delhi, NCR. These products are fabricated from the most premium quality of mild steel and stainless steel to ensure longer service life. We have a large and technologically advanced manufacturing unit that is equipped with the latest machinery to enable a high efficiency of operations. Further, our workforce is headed by highly proficient engineers and technicians who ensure that our products are manufactured in the most efficient manner and adhere to the highest quality standards. Our range of mild steel and steel products includes Wooden Gates, Beds, Chairs, Chair Table Set, Sofa Sets, Kitchen Counter and Steel Furniture.